An increasingly popular design is the exposed beam ceiling. The exposed beam ceiling is in high demand for the openness, attractive, and impressive especially for those that have conventional ceilings. Exposed beam ceilings are sometimes also known as vaulted, cathedral, or raised ceilings. The rise in popularity is contributed to the various lighting (artificial and natural), design styles, and ceiling heights. Although similar to most things, there are drawbacks and negatives along with the positives. On the Mr. Handyman blog, they post to discuss the pros and cons in choosing exposed beam ceilings. An exposed beam ceiling is created by exposing the beams supported any above floor. Another type of exposed beam ceiling are beams imitating support beams. The demand for exposed beam ceilings is in part due to the flexibility of design. An exposed beam ceiling is a great feature to create a sophisticated and approachable space. This type of ceiling can complement a clean modern design, a rustic design, or even a contemporary design. Trendy and stylized lighting amplifies the design and décor of a space. Lighting options are varied depending on the chosen design, including industrial pendant lighting and track lighting. The raised ceiling heights and many design options are perfect for the modern office space. Many modern businesses are looking for a unique atmosphere that is typically created with exposed beam ceilings and brick walls. The combination of original brick walls and exposed beams is a highly requested by many businesses. 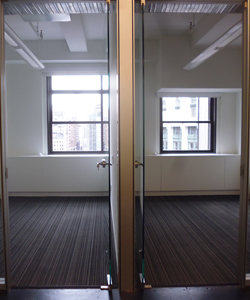 The high demand is mostly attributed to the trend leaning towards an open and spacious workspace. Exposed beam ceilings are a trendy commercial feature in many spaces leading towards an open and spacious space. Interior design features highlight structure and beams mostly left unfinished. New buildings are currently including high ceilings, operable windows, and larger floor plates. Plenum HVAC systems benefits the builders in maintain structural features. Exposed beam and ductwork ceiling may be aesthetically ideal for some especially for those seeking an industrial design. Older buildings have structures and ceilings that are designated for preservation. Modern buildings on the other hand use a lightweight structure to act as the building envelope. Although, as with any design altering the structural component that serve a specific purpose may have an impact. While exposed beam ceiling are aesthetically pleasing to some, to others it may be displeasing. One example is fireproofing which is not appealing although spray-applied fireproofing dampens noise. A steel building may have this type of fireproofing. Removing the drywall exposing the joist may lead to violations of the fire code. The cast concrete building feature the quintessential loft that is very on trend today. In addition to the fire code violations, be aware of the protections the drop ceilings afforded. Smoke detectors, HVAC ductwork and piping are usually hidden under a drop ceiling. These elements should not removed or altered when exposing the ceiling. One of the most popular features of loft architecture is the exposed beam or open ceiling. The open ceiling is a definitive element of a certain aesthetic. A current trend and demand is for an exposing not only of the beams, but also for the mechanical wiring and ductwork. Small and large businesses are willing to pay top dollar for a loft space even if it is located in a less desirable neighborhood. 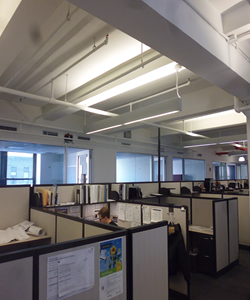 Open exposed ceilings have become more prevalent and applicable in several older buildings. The tenant must be informed of the potentials issues that may arise. The open ceiling may not be financially smart due to the extra energy cost to heat and cool the air. In addition to the energy cost, all renovations must be done to code. An informed tenant is perfect to overcome the drawbacks of the open ceiling. If your in the market looking to lease a loft space or traditional office that features high exposed beamed ceilings - give us a call at no obligation - our services are free as tenant brokers.